Norrköping Airport (Kungsängen) was founded in 1934 and is one of the oldest civil airports in Sweden. Since 2008 it has been owned and operated by the local municipality. The scheduled traffic consists of Danish Air Transport twice a day to Copenhagen and Flybe to Helsinki. Charter flights include destinations to Tenerife, Gran Canaria, Madeira, Mexico, Mallorca, Crete, Rhodes, Turkey, Croatia, Cyprus, Kos, Azores and more. The airport also receives imported horses from Reykjavik by Icelandair every month. Waltair runs a taxi flight business based at Norrköping Airport. Kungsair training offers flight training using 4 airplanes. There are also flying clubs including gliding activity and historical military flights. The airport also has military training traffic. 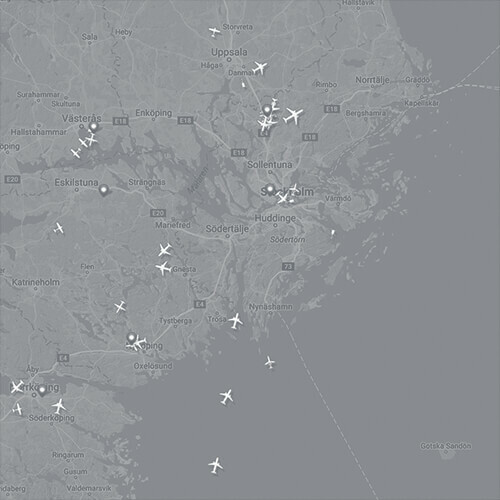 Air traffic volume averages around 18,000. The runway is 2,2 km, and has ILS in both directions. A 600m grass strip is also found on the field. The first tower was erected 1945, the current tower replaced it in 1993.